By mid-1945 the battles of the strategic Labuan Island and Brunei Bay objectives, except for the persistent Pocket, had been mastered by the Australian First Corp and two subsidiary mainland operations ordered. One was the amphibious assisted landing near Miri and the other was the seizure of Weston east of Labuan across the East Channel of Brunei Bay, meanwhile the pressure on the Pocket continued. A probing attack by the 2/28Btn met with heavy fire from mortars and machine-guns, a flanking attack failed and the Australians withdrew. For the next few days and nights 2/15FldRgt bombarded the Pocket with 140tons of explosive projectiles while the 2/11 Commando cavalry Squadron had reconnoitred the track on Lyon Ridge and reported it suitable for tanks, provided the large bomb crater was filled. So the next morning Maj Lyon’s company of the 2/28Btn with Lieut Hall’s troop of tanks attacked this side of the Pocket. One platoon moved forward protected by a Matilda dozer while it filled in the crater then moving on to the first ridge but the heavy fire from the next ridge pinned the infantry and disabled the tank. 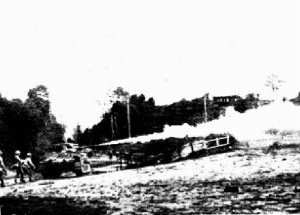 By midday Lieut Avern’s troop of Matildas relieved Hall’s and pushed on ahead, one tank hit a bomb and jammed the turret wounding the driver, another bogged 50yards further and the infantry casualties were mounting. It was decided to continue the bombardment of the area with field guns for the next two days then the cruiser HMAS Shropshire also shelled the Pocket with its 8inch guns. Each salvo fired with precise deliberation at pinpointed map references adjusted by an artillery observer in a scout plane controlling this ruthless bombardment. The next day the infantry continued to probe with the support of tanks but the bombardment continued into the following day. During a brief lull six sleek silver Lightnings flashed over the ridge in a trail run, circled then returned and diving steeply the belly tanks of napalm tumbled down and a vivid flash with a deluge of flame enveloped the enemy held area, then the warbirds returned for a strafing run. The enemy commander understanding the situation was hopeless decided on a desperate attempt to break out and inflict a maximum of damage before the inevitable end. In the dark morning light at 4.30am 21 June two kamikaze groups, about fifty Japanese desperados each, had stealthily sneaked out of the shrinking Pocket through the smelly swamp. The Japanese achieved surprise, managed to cause some casualties and raided the logistics base at Labuan town and for an hour or so there was confused fighting in which engineers, pioneers, cooks, clerks, and other service personnel of the Beach Group were involved. A swiftly arranged offensive defence by Sergeant Antill of a small party armed with rifles and bayonets, supported by the firepower of a detachment from the American Boat and Shore Regiment, killed all the attackers and many weakened Japanese soldiers that were exterminated had 300lb ariel bombs strapped to their back. Meanwhile as the day dawned 2/28Btn had begun its directed two company attack on the shallow Pocket. Lushington’s company with a troop of tanks punched westward, while Lyon’s company with another troop Matilda gun tanks and two Matilda Frogs would thrust headlong into the depthless fortress. When opposition was encountered the gun Matildas would engage it from the flanks while the Frogs frontally forced the attack, normally opened up the fire flame while advancing at ranges between fifteen to 30yards and not one tree or square yard was unscathed from the terrific weight of firepower concentrated on this last enemy stronghold. Later the bulldozers moved in and buried over 100 Japanese dead and by this stage 389 Japanese had been counted killed plus the uncounted and a total of 11 prisoners taken with the 24BG losing 34 killed and 93 wounded.